ECB cuts main interest rate to zero – what will it mean for you? Today the European Central Bank announced that it will cut its main interest rate to 0.00 per cent from 16 March 2016. We take a look at what this will mean for you. After nearly eight years of cutting interest rates to stimulate the European economy, the ECB has finally cut its main interest rate to zero. The rate cut, which will take effect from 16 March, will see the ECB’s main interest rate fall from 0.05 per cent to 0.00 per cent. The interest rate cut represents a drop of just five basis points, and it the smallest rate cut since the ECB began reducing rates in 2007. However, a zero per cent ECB interest rate is hugely significant because it means that our banks can now borrow from the ECB for free. A zero per cent interest rate is also significant because it represents a barrier that central banks have been reluctant to cross. If the ECB were to cut its main rate again, it would have to offer negative interest rates – meaning banks would actually be paid to borrow money. 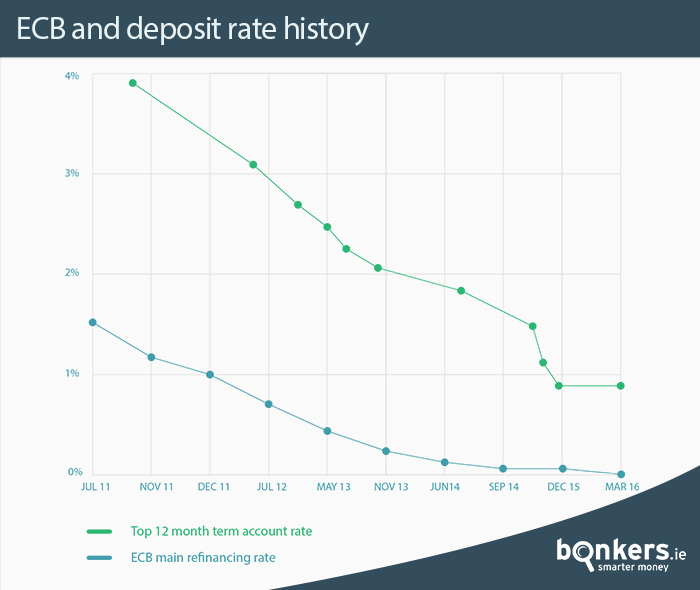 The knock on effect of this could be negative deposit interest rates, which would mean savers having to pay their bank to keep money on deposit. The European Central Bank also cut the interest rate on its overnight deposit facility by 0.10 per cent and it now stands at minus 0.40 per cent. It means that if banks want to put money on deposit with the ECB, they must pay to do so. So what does a zero per cent ECB rate mean for mortgage holders? The ECB zero per cent announcement is likely the final piece of good news for tracker mortgage holders who have seen their payments fall steadily for years with every cut in the ECB rate. With the ECB rate set to hit zero next week, customers with tracker mortgages will just pay the “margin”. So, if your tracker is 1.0 per cent above ECB – your mortgage rate will be 1.0 per cent from 16 March. As a result, tracker customers will likely save around €3 per month for every €100,000 borrowed over 30 years. Customers with regular mortgages will probably not see a rate cut in the short term. However mortgage holders have been switching in large numbers for better rates since banks began competing for new customers last year with new discounts and special offers. In the last quarter of 2015 mortgage switching was up 105 per cent on the same period the year before. Standard variable customers generally pay around 3.0 per cent more than customers with tracker mortgages. This can mean that standard variable customers pay €150 more every month per €100,000 borrowed over 30 years than customer with tracker mortgages. What will ECB rate cuts mean for savers? Savings interest rates are now at record lows - and savers can expect to see a further fall in the interest earned on savings as a result of today's announcement from the ECB. It is likely that customers will see cuts of between 0.10 and 0.25 per cent on notice and term accounts in the coming months. This could bring the very best rates available to savers to less than 1.0 per cent.